Changes are being made to the restoration plans for Thurcroft Colliery in Rotherham that would result in the importation of 1.8 million cubic metres of waste. Producing coal in continuous activity from 1913 until its closure in 1992, a range of activities were undertaken during the lifetime of the colliery including a coking plant and brickworks. By the early 1930s a railway track linked the colliery complex to the main railway and by 1947 the pit employed over 2,000 people. Planning permission was granted in 1998 for an integrated landfill, coal recovery and subsequent reclamation operations of the 190 hectare site. Moving five million cubic metres of spoil from an area to the north of the site to yield approximately 400,000 tonnes of coal, it was also proposed to import approximately 3.75 million cubic metres of household and commercial waste at an estimated rate of circa 200,000 tonnes per annum. Whilst coal recovery operations have taken place, no waste has been received at the Kingsforth Lane site for disposal and the restoration has not been completed. The site has attracted anti-social behavior. Now FCC Environment, one of the largest waste management companies in the UK, is applying to extend the life of operations by ten years until 17th July 2026, with a further one year for restoration. It also wants to make changes to the restoration levels and to the type of waste imported to the site. The plans state: "The coal recovery operations have left a large void which was due to be restored to an acceptable landform through the importation of household and commercial waste. Due to nation-wide decline in household and commercial waste inputs to landfill, and the surplus availability of alternative local landfill provision, there has been no importation to date and thus the area remains unrestored. "It is recognised that there is a need to undertake some engineering works at the site to deliver an acceptable, safe and sustainable final restoration scheme." Following initiatives by national and local governments to reduce the volume of waste going to landfill, the applicants have investigated alternative options to provide a long term sustainable landform. It is now being proposed to import 1.8 million cubic metres of "low risk materials" such as soils, construction and demolition waste. Ten "cells" would be engineered and filled that would both occupy a smaller footprint than that previoulsy agreed; and would result in a final restoration level which is up to 29 metres lower than that currently consented. The proposed landform would be "markedly less visible from the surrounding area when compared to the approved scheme." Waste disposal operations would be limited to 0700 to 1900 hours Monday to Saturday and 0700 to 1700 hours on Sundays with waste monitored in accordance with both the planning permission and Environmental Permit in place. DEFRA has conversion factors for demolition and construction waste and rock and stone as 1.2 tonnes per cubic metre. This would mean that the importation of 1.8 million cubic metres is equivalent to 2.16 million tonnes. Based on typical 20 tonne HGV payloads, the applicants estimate 55 HGV trips per day (55 in and 55 out) to access the site. It is also anticipated that approximately six full time members of staff would be employed throughout the ten year extension period. When the importation of waste is complete, the Green Belt site would be restored to species rich grassland and woodland. The plans come at the same time as plans are updated for the restoration of Maltby Colliery. Across the borough, Grange Landfill Ltd was granted a variation to an existing permit to reopen the tip off Droppingwell Road, Kimberworth by the Environment Agency. It allows for the importation of inert waste for disposal and restoration of 205,000 tonnes a year. Would these 55 trucks be banned from entering the Village of Thurcroft? IE coming in from Hellaby. 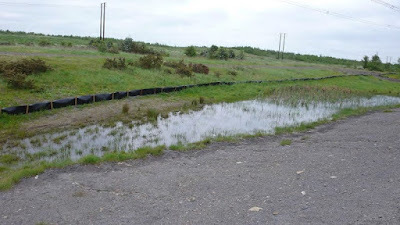 The roads around Thurcroft are in a poor enough state without having to contend 55 x 20 ton trucks per day. Thurcroft resident of 40 years. after many, many years of coal mining with all the problems of noise, dust etc the area was then subject to the waste left being all dug up again to remove poor quality coal deposits,the area and void left was a bigger eyesore than before. now the area again is again about to have another 10 years plus of noise dust and traffic problems to the local area. come on rotherham council after more than a hundred years of all this to the area of thurcroft and surrounding villages is there any end in sight or are we awaiting all the materials to be dug up for the new hs2 railway to be delivered there as well.